Two minutes and 12 seconds. That’s how long my spearfishing partner had been underwater on one breath. I last saw him descending past 100 feet, toward the 125-foot bottom. I floated on the surface, ostensibly as his safety diver, more realistically just praying that he would ascend out of the abyss. Soon. With each passing second a new and more terrifying scenario ran through my mind. Maybe he shot a fish and got tangled in the reef. Did he pass out on the bottom? What about that shark we saw? Then, just as I was about to do … something … I caught a glimpse of him rocketing up from the depths. I swam over to meet him as his head burst above the waves. I was relieved he was OK. Right up until his eyes rolled back in his head and he sank below the surface, dropping his gun. I grabbed him and pulled his head back above water. “Kyle! Kyle!” I yelled. His eyes opened and he took a breath. “I’m good,” he said. But he wasn’t. His lips were blue, he was disoriented and weak. Kyle had experienced a shallow-water blackout. Essentially, he had fainted from hypoxia. On land, you might fall and bump your head. In the ocean, without help, you sink and die. While statistics are elusive since most deaths occur alone, it’s said that shallow-water blackout accounts for more than 99 percent of freediving deaths. Sharks, boat accidents – nothing else comes close. It’s tragic because it’s so preventable. Just. Don’t. Be. Stupid. Soon after watching my friend almost die – motivation I would not recommend – I did an uncharacteristically smart thing: I boarded a plane to freediving’s mecca, the west coast of Hawaii’s Big Island, to take a Freediving Instructors International level-one class, a course designed to make a very dangerous sport safe, or at least safer. IT’S OFFICIAL: I’M AN IDIOT. I met my FII instructor, Cory Fults, shortly after I landed. A 24-year-old underwater photographer with male supermodel looks and the modesty of a guy who genuinely doesn’t know he looks like a supermodel, Fults — who grew up in Newport Beach before moving to Hawaii to pursue the sport — spends four to six hours in the ocean every day. Like many other world-class freedivers, Fults moved to Kailua-Kona for the ocean conditions. Because the island is the youngest in the chain, it hasn’t had time to build up many sandy beaches or mature coral reefs. This means the water is very clear and very deep mere yards from shore. “Plus, the island is so large that it blocks the trade winds, so ocean conditions are smooth and perfect most days of the year,” Fults tells me. Then there is the abundant sea life; Kona has long been fabled for its world-class sportfishing. So, whether you’re a spearfisherman or just want to swim with large ocean animals like dolphins, whales and sharks, Kona is the place. Most people take up freediving for one of those two reasons, many defecting from scuba: You’re not getting near dolphins or gamefish sounding like a bubble-blowing Darth Vader. It might seem that freediving is so dangerous because we air-breathing, finless humans are ill-equipped for the ocean. You’d be wrong, says Fults. Freediving is dangerous because most humans are idiots (I’m paraphrasing). One, we do really stupid things like diving alone and pushing our limits. Two, we don’t properly use our natural gifts. In fact, humans have been freediving since long before the advent of $700 wetsuits and custom-made monofins. There’s evidence of freediving activity dating back 4,500 years, and Greek historians write of freedivers recovering treasure and sneaking behind enemy lines. The point, says Fults, is that the best equipment humans have for freediving is their own physiology, specifically something called the mammalian diving reflex: When our face is submerged in water, our heart rates slow, blood is diverted from the extremities to our vital organs, and blood vessels constrict. This allows us to dive longer and more safely. It’s how world-record holder Herbert Nitsch was able to dive to 831 feet on a single breath. “We’re not as good at it as whales or dolphins, but we’re pretty good,” says Fults. The better part of the next two days are dedicated to attaining and retaining this state, along with learning how to make freediving as safe as possible. That is why world-record freediver and Kona resident Martin Stepanek founded FII. He saw too many needless deaths and contends that when done with proper training, knowledge and safety precautions, freediving can be as safe as surfing, sailing or soccer. I tell Fults that I have received stitches in all three of those endeavors. There’s an awkward silence. We move on. After working on diaphragmatic breathing to slow my heart and calm my mind, the proper technique for breaking the surface and a dozen other things I’ve developed horrible habits for, I’m ready (very relative term) to hit the ocean for some line diving – literally diving down and up a line. We travel a few miles down the coast to Honaunau Bay, a bite out of the coast that’s a favorite among freedivers. So frequented is Honaunau by freedivers, there are three permanent mooring lines at various depths. We swim the 75 yards out to the first one, in 160 feet of water, to tie off our float, then drop a weighted line to 80 feet. 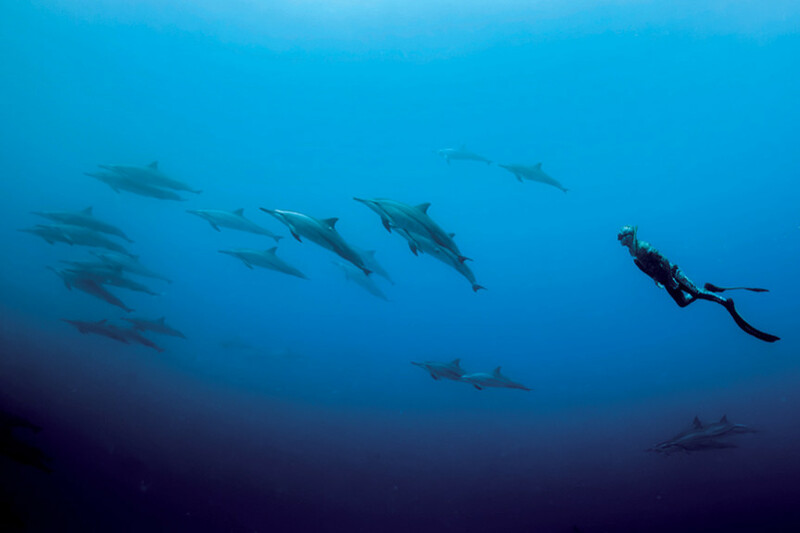 The short swim takes a while, though, since we run into dolphins and I spend many awe-inspiring moments diving and swimming with them. The dolphins do laps in the bay, making them easy to get near. Fults says this has become a problem because they use the bay to sleep, which means turning off half their brain while leaving on the other half to identify predators. The contrast created by the sandy bottom of the bay, one of few on the island, makes it easy for them to spot predators. It also means that tour boats and bozos like me can easily find them for GoPro selfies, disturbing their rest. “If they can’t rest, it makes them less successful hunters, which could lead to survival issues,” says Fults. Way to kill a dolphin buzz, bro. At the line, Fults tells me to remove my mask but keep my snorkel in my mouth, and submerge my face for five minutes while practicing relaxed breathing from my diaphragm. This will trigger the mammalian diving reflex. After that, I’ll perform a few 33-foot warmup dives. When I freedive at home, my first half-dozen dives are usually deeper than they are long — 24 seconds at 30 feet, etc. — so I know it’s going to take more than two of these to get warmed up. Still, I breathe, descend, wait, return to the surface and flash Fults the OK sign. I look at my watch. One minute, 21 seconds. Whaaaaat? “That felt like 20 seconds,” I almost scream. Fults teaches me other ways not to “be an idiot and die.” For instance, he explains that it’s not our lack of oxygen that triggers our urge to breath but a buildup of carbon dioxide. That’s why hyperventilation, which decreases the natural level of CO2, is so dangerous. Sure, you’ll stay underwater longer, but it can delay the urge to breathe until your oxygen level is below the level you need for consciousness. Hello shallow-water blackout, or worse. During a blackout, he tells me, your brain does a pretty smart thing: It closes your windpipe so no water can enter. So, until you take your last desperate “terminal breath,” your body prevents water from entering your lungs. But during a samba, that doesn’t happen, and since you can’t control your limbs, you sink, breathe and drown. “It’s another reason that the first rule of freediving is always dive with a partner,” says Fults, for like the 186th time in three days. In the next 30 minutes I easily hit 66 feet and want to go deeper. But in level one, Fults can’t let me. Safety strikes again. Two freedivers train by diving down and up a line. Cory Fults, who has descended to 220 feet on a single breath, says training with a partner is essential. Dubbed the Rolls-Royce of Navy SEAL attack boats, LeMaster’s 11-meter rigid-inflatable boat is built for speed and maneuverability; it can reach 50 miles per hour and turn or stop on a white cap. LeMaster uses these features to hunt large open-ocean animals — everything from dolphins and pilot whales to false killer whales and large sharks — so guests can swim with them. His is the only tour on the island that does this, so I ask him how he gets away with it when others can’t. About 30 minutes later, that phrase runs through my mind as we slide overboard about a mile offshore in thousands of feet of electric blue water and immediately see two very large oceanic whitetip sharks, a species known to be aggressive. I did my best to get my mammalian reflex to kick in and slow my heart — not easy when a 10-foot shark is deciding whether you are food. But really, it’s an experience like no other. LeMaster limits his tours to eight people, with two in the water at a time, so animals don’t spook and encounters are as natural, and as close, as possible. In the next hour we swim with (awake) dolphins, short-finned pilot whales – “The males can get protective, so stay alert,” says Fults – and finally move into Kealakekua Bay for a reef snorkel. On the boat ride in, everyone smiling and calm after their ocean encounter, LeMaster decides it’s a good time for some “speed work” to show just what an ex-Navy SEAL attack boat can do. LeMaster makes the “grippy grippy” sign (a clenched fist in the air) and puts the hammer down on the 940-hp jet engines below our feet. The SEAL boat leaps into action as if armed combatants have just invaded Kona. LeMaster steers directly — directly — at the cliffs in a move that I’m certain is expressly forbidden by his insurance policy. We close on the cliffs, each of our fun, excited, wow-this-thing-is-fast Disneyland grips rapidly turning to this-maniac-is-trying-to-kill-us death grips. About the time we are all thinking, “Do I have time to abandon ship before we smash into that cliff face?” LeMaster throws the helm to port and we seemingly bank off the cliff at 50 mph, close enough to see crabs fleeing into cracks. LeMaster looks back and smiles – or checks to see whether we’re still there. I’m not quite sure which. I do see why LeMaster does this on the way in, however – my heart rate won’t be under 100 until Christmas, and if I got in the ocean right now I’d have a breath hold of two seconds. LeMaster performs a few more of his “speed work” maneuvers while Fults tells us about the history of the cliff faces we nearly smash into (Honestly, Cory, no one is listening). Soon we are back at the harbor and LeMaster has skirted another massive wrongful death suit, given seven visitors a lifetime of cocktail chatter and helped convince me that, relatively speaking, maybe freediving isn’t so dangerous after all.